Everyone likes flowers so it makes sense that people give them to their significant others every single Valentine’s Day. It’s a day to celebrate your love for each other, and while some may not participate in the mainstream or conventional way, it’s a time to love, cherish, and appreciate regardless of how you show it. Roses are one awesome way to do this (although they are very cliche, I for one, prefer daisies myself). So, if your boyfriend or girlfriend bought you some, don’t you dare throw them out! Roses have a number of benefits besides sitting in a vase and looking fancy. They reduce redness, calm irritation, and soothe the soul. 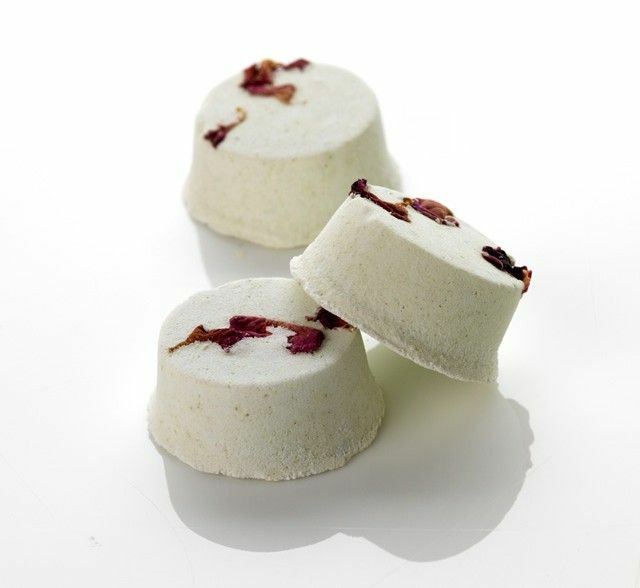 Here are six incredible uses for rose petals that will make you feel lush and luxurious even after the chocolate has been eaten. This one is my favorites. This is something I advocate for typically in the summer months to keep you cool, fresh, and relaxed during sticky weather. Roses are packed with Vitamin C, so they help protect and soothe your skin from sun damage. But it doesn’t need to be in a spray bottle! 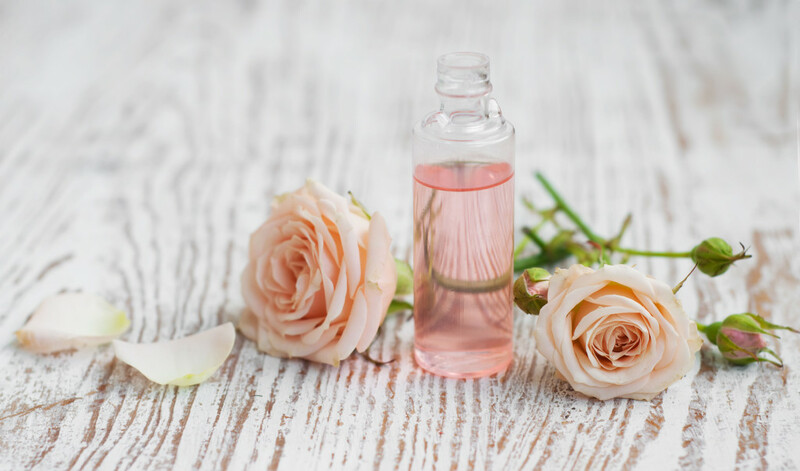 Check out our tutorial on how to make your own organic rose water. Similar to LUSH, you can make your own floral steamers. They are great to pop in a bowl of hot water and place your face over the bowl, allowing the steam to open your pores and help your skin care regime. Dry your roses out or keep them fresh, it’s up to you! Similar to LUSH, this organic steamer can be used as a toner for up to one week. Tip: Roses are known to de-puff the eyes and reduce dark circles too! Check out the recipe for rose steamer tabs here! People often add rose petals to their bath to allow the warm water to release the natural rose oils to moisturize and soothe your skin. It makes your bath smell and skin feel decadent. 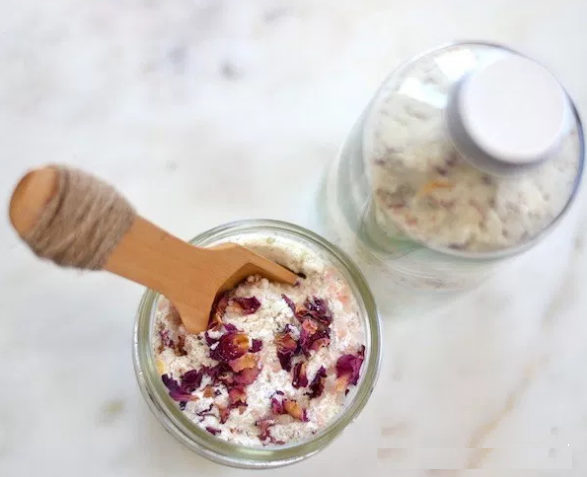 You can kick it up a notch and make a rose milk bath soak with this recipe here. You can also use Epson salts and Himalayan salt. Pour yourself a glass of champagne and relax. The recipe can be found here! So I admit, I ripped off this idea from Martha Stewart (sorry girl!). 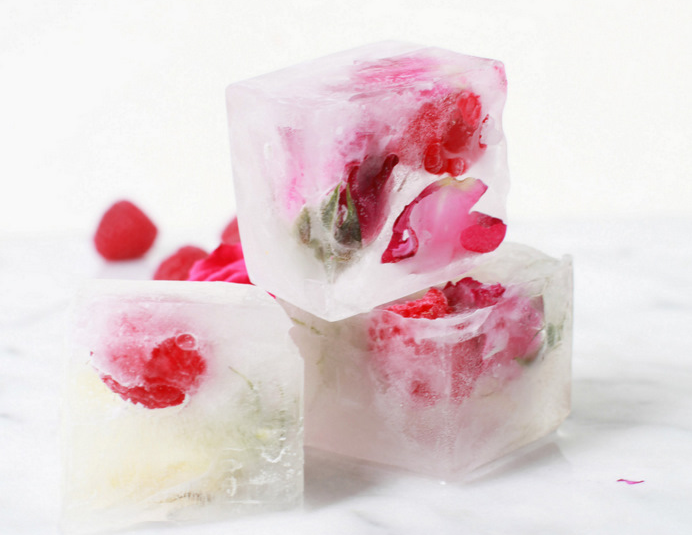 What a beautiful idea to put your Valentine florals in an ice-cube tray to freeze, only to be used as a fancy enhancement to your normal chilled drinks. Beautiful, floral, elegant, and lovely. Check out how she does it here. 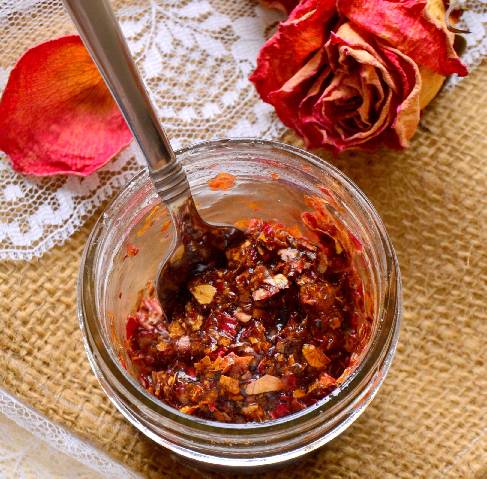 We see rose oil being used a lot in face masks, however, you can DIY it! If you have bentonite or kaolin clay, adding dried rose petals or using DIY rose oil or water to mix up a mask is an incredible way to soothe your skin. No clay? No problem! Add to raw honey for a rich and sweet skin brightener. Check out this beautiful recipe here. We see flowers being used a lot in fancy teas (Teavana, I’m looking at you). Jasmine, Chamomile, Dried Roses, Orange Blossom, you name it. 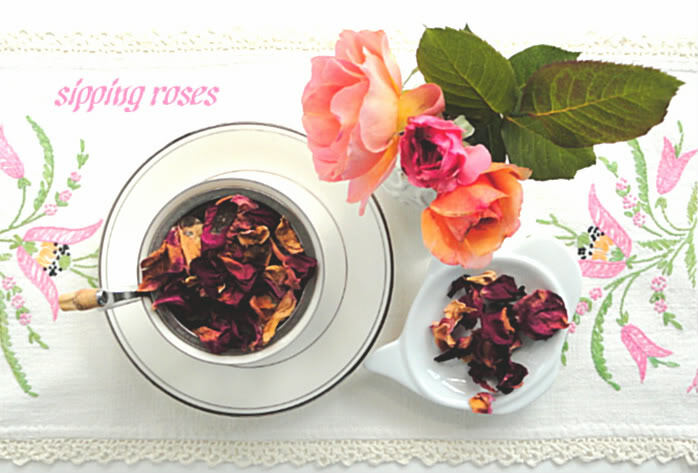 Why not give yourself a boost and add some dried roses to your morning tea? They are anti-bacterial and boost the immune system! Find this new and fancy how to guide here. Perhaps my sister should have re-considered giving me her Valentine’s Day roses as they were beginning to whether for my own cosmetic purposes. I am excited to use the natural, botanical, beautiful properties of the rose to make my day a little brighter. Give it a try and comment below to tell me how your experience was!